The Oneway Live Center is very heavy duty and constructed to withstand hard use by professionals. This live center has double row sealed ball bearings that are housed in a 2-1/4'' long by 1-5/8'' dia. body. The end threaded section, which is 1-1/8'' long and is made into a 5/8'' dia. cup center (with a removable center point) rotates, promoting maximum safety and precision. A knockout bar is provided with the live center for removing the center point. The two bullnose cones that come with the live center make it very useful. The Oneway Live Center is made hollow so it can be utilized for 5/16'' dia. long hole boring with a long hole boring auger. 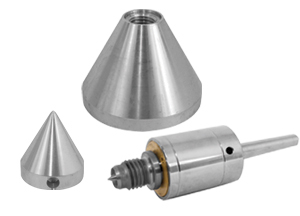 Standard equipment includes: two aluminum cones that can be threaded onto the cup center to allow self-centering on any hole up to 3-1/4'' in dia. The larger cone can also be reversed, permitting self-centering of round or square spindles up to 3'' in dia. The smaller cone can center on holes up to 1-1/2'' in dia. Available in #1, #2 or #3 Morse Taper.